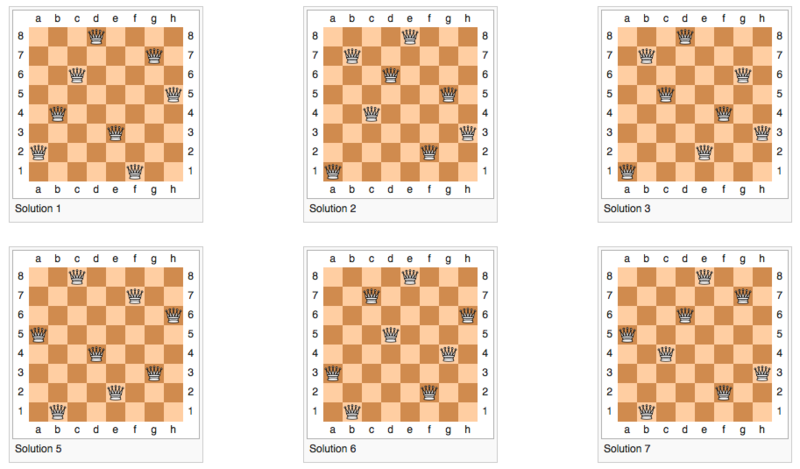 Here’s a classic puzzle: the eight queens puzzle. The eight queens puzzle is the problem of placing eight chess queens on an 8×8 chessboard so that no two queens threaten each other. Thus, a solution requires that no two queens share the same row, column, or diagonal. The eight queens puzzle is an example of the more general n-queens problem of placing n queens on an n×n chessboard, where solutions exist for all natural numbers n with the exception of n=2 and n=3. I solve puzzles from time to time to keep my motivation up and to get some exercise for my brain. But mostly for fun. In this puzzle on a standard 8x8 chess board there are 92 solutions where no two queens threaten each other. I’ve moved more and more into functional programming lately so this is my take on it. Have you any ideas for improvement?